Nancy E. (Pizzuto) Kelley – in Woburn, December 1, 2018, at 73 years of age. Beloved wife of the late Patrick M. Kelley. Cherished mother of Karen Doucette, her husband Robert, of Stoneham, Kathy “Lane” Wing of Woburn and George Kelley of FL. Loving “Nana/Nan” of Danielle Nicholas, William Cerasuolo, Robert Doucette, Marissa Kelley, Lily Wing and great grandma (Gigi) to Ava and Gabriel. Nancy is also survived by many loving family and friends. At Nancy’s request her Funeral Service is private. A Celebration of Nancy’s Life will take place in the not too distant future, and will be announced by her family. Nancy E. (Pizzuto) Kelley, the beloved wife of the late Patrick M. Kelley, passed away very peacefully at her home surrounded by her family (as she always wanted) on Saturday, December 1st, 2018 at the age of 73. Born in Cambridge, Nancy was one of five children of the late Peter and Georgina (Conrad) Pizzuto. Raised and educated in the City of Cambridge, Nancy was a graduate of Cambridge Rindge & Latin High School. In 1964 Nancy married her high school sweetheart, Pat Kelley. She and Pat loved to travel & spent a lot of time in Florida where they one day hoped to retire to. That dream was cut short in early 2000 when Pat passed away unexpectedly. But…summers were always fun times for the Kelley family. Every year they would go camping in Wolfboro, NH where their “Aunt Alice” had a Campground. Another yearly tradition was Nantasket Beach where the entire family including grandparents, aunts, uncles, and all the cousins would stay in cottages right close to each other and have the best times! Clam digging at the beach during the day and the games & rides of Paragon Park at night. The journey over their thirty five years of marriage together would bring them 3 children: Karen (Kelley) Nicholas-Doucette, George Kelley and Kathy “Lane” (Kelley) Wing; and 5 grandchildren: Danielle Nicholas, William Cerasuolo, Robert Doucette, Marissa Kelley and Lily Wing (the last of which Pat never got to meet). And later, 2 great-grandchildren: Ava Cerasuolo and Gabriele Doucette. Once the family grew and the grandchildren began arriving, “Nana/Nan” stepped right up to the plate! She loved being a grandmother & great-grandmother just as much as being a mother & had a big hand in raising all of her grandchildren. In 2007 Nancy was diagnosed with breast cancer which, throughout the next 11+ years would spread through her body. This is when her real self would be revealed to most of those who know her now. Cancer didn’t pull her down, surprisingly it lifted her up. It brought back out in her – in full force – the selfless, caring person she had always been. She loved nothing more than volunteering at the Lahey Clinic Cancer Center where she was a patient herself for over a decade. When she wasn’t in treatment for her illness, she was at that hospital doing whatever she could to help others with cancer and their families. 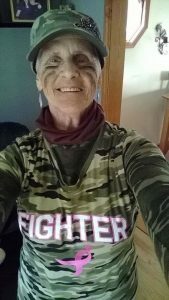 Even after the volunteer program was cancelled at the hospital, that didn’t stop her – she went in anyway! Nancy had met all sorts of people at the Lahey Clinic Cancer Center, most of whom were from Bermuda…she called them “Her Bermudians”. They took to her like some many people did & invited her to the island. She went back many times these last 11+ years and stayed with multiple friends. Always so positive, always brightly dressed with earrings to match – she was given the name “Fancy Nancy”! When she was arriving and/or leaving Bermuda, an announcement would be made over the air waves; gatherings would be held and they had even honored her with a parade there not long ago. Nancy definitely made an impact! At Nancy’s request her Funeral Service is private. A Celebration of Nancy’s Life will take place in early-mid January and will be announced at a later date by her family. At Nancy’s request her Funeral Service is private. A Celebration of Nancy’s Life will take place in the not too distant future, and will be announced by her family. My thoughts and prayers are with the Kelley family, Nancy was a careing loving person with a heart of gold, she will be sadley missed. She was a fighter and a true worrier. May she rest in peace.